I haven't really talked about this. Well not in great detail to many people. I have glossed over the details. Who really wants to admit stuff like this anyway? This post has been in the back of my mind since I started this blog. I just needed to find the right words. On Friday I got in one of my lovely moods where I am mostly inappropriately open about things in my past. I posted on a friends link about treatment of mentally ill people in prisons. It all snowballed from there and I ended up pouring my story out to this friend. I’m glad I did because it gave me the push in the right direction I needed to start this post. The post where I talk about why I was in jail and what happened. I had a volunteer job and while on my lunchbreak I walked into a chemist and demanded drugs with a knife. I had no intention of hurting anyone except myself I was just desperate. I couldn't take an overdose on over the counter stuff as I had developed a gag reflex to most of it. It was my 'local' chemist and everyone except the woman i threatened knew who I was and my history. She pressed the panic button and the police were there in 5 minutes. I got arrested and was denied bail. I was in prison while awaiting a court date for 2 months. It was the longest 2 months of my entire life (I’ve been pregnant remember and we all know how that time just flies :|). Thankfully I was allowed bail at my next hearing. I was 19 at the time. It was definitely an eye opener. I don't have a great deal of trust for people in authority anymore. The uniformed police officers and chemist workers wanted for me to be hospitalised, but the head detective had other ideas...until he interviewed me and realised how much of a mess mentally I was. By then it was too late to turn back. I was refused bail on the basis that I was a danger to myself. Mental Health interviewed me and deemed me mentally sound….The officers at the watch house rang them again multiple times to tell them they needed to reassess, they refused saying that I was sufficiently medicated and there was nothing more that they could do. I must add that they did nothing to my medication between me taking a knife into a chemist with the intent of getting medication to kill myself and them finishing the initial assessment. 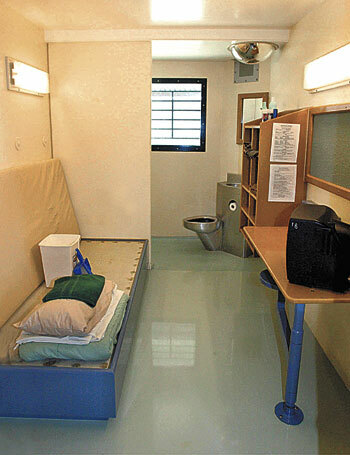 This is exactly what one of the cells in the jail I was in looked like. See that nice silver dome on the roof at the back? That's a camera, yes they can see you pee. At the opposite end to the toilet is the shower...yes they can also watch you shower too. See the size of the room? You went into 'lockdown' from 6pm until 6-7am. There was no getting out. There was no talking to anyone else. You could watch tv but it's easier to just sleep. The guards had around 1.5 hours for lunch each day. Yep you guessed it we were locked down for that too. Every Wednesday was training day. This essentially meant that most of the jail was locked down for most of the day. We even had to eat our lunch in our cells on that day. Next time you make a flippant comment about how being in prison is easy...just think about all that. I can't even fathom what it is like for a person with a mental illness to endure that. I have Bipolar and have suffered depression (with suididal intent), agoraphobia, social phobia, PTSD and PNPsychosis and an anxiety disorder. I believe that you were incredible strong to survive that experience. I don't think i would have.